The historic Riverside Hotel is located in the heart of Downtown Fort Lauderdale, as the only hotel on the city's prestigious Las Olas Boulevard. Opened in 1936 by the Wells family, who also developed the Boulevard, the Riverside Hotel is both luxurious and laidback, mixing Caribbean style with old Florida charm. The 12-story property features 219 guest rooms inclusive of 6 suites accentuated by Tommy Bahama®-styled design elements, vintage décor, as well as the most discriminating detail - sweeping views overlooking the city skyline and the New River. 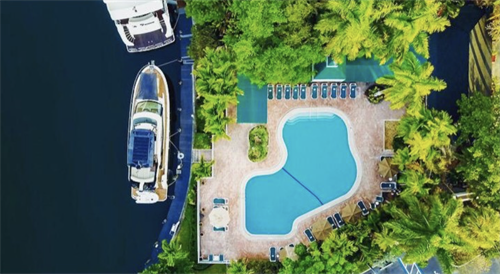 Amenities include a heated outdoor swimming pool; a fitness room; complimentary wireless internet; a marina with boat dockage space, accommodating vessels up to 150 ft.; more than 11,000 sq. ft. of indoor banquet/meeting facilities; and outdoor catering venues ranging from 800 sq. ft. 20,600 sq. ft. The hotel also houses several dining options including the new Wild Sea Oyster Bar & Grille, a culinary haven boasting ultra-fresh seafood and late night entertainment, Preston's Wine & Martini Lounge located in the main lobby, the Golden Lyon Vintage Pub, and Indigo, a neighborhood restaurant where patrons can choose to sit within its comfortable dining room or dine al fresco along Las Olas Boulevard. Guests of the Riverside Hotel can now earn Stash Hotel Rewards points. It is also a pet friendly hotel. The Riverside Hotel is located at 620 East Las Olas Boulevard in Ft. Lauderdale, FL, just minutes from the Fort Lauderdale International Airport, Broward County Convention Center, Port Everglades and the sandy white beaches of Fort Lauderdale. For additional information and booking please visit www.riversidehotel.com.